I remember it as a very dirty looking mainly single storey remnant of a pub. All that was left after the Blitz. It had a large square porch stuck out into the pavement, with the famous soot covered stone "Mucky Duck" mounted on the roof. The Malin Bridge bus stop was located just outside the pub door. I must have spent months of my childhood waiting for the bus while being wafted by stale beer fumes whenever the door opened. There was a mysterious wooden door located in the corner by the shops below. I seem to remember this was alluded to in a spoof article in the Twicker student rag mag. I never did see any mac clad blokes going through it though. The modern replacement was just like any other sixties built pub and went through several guises but was never to my taste. The original was on the opposite corner, where the hotel now stands. The original Mucky Duck was demolished and the new pub was built on the footprint of the original building. The hotel you mentioned replaced the ABC cinema which in turn was built on what was a temporary car park placed on a bomb site. I spent enough time outside that pub waiting for my bus to know exactly where it was located, just below Bank Street. See Picture Sheffield s22225 and various other photos on the site. There is another photo number s19557 which reckons to show the pub after it was demolished but in actual fact it shows a post blitz scene where the damaged part of the original pub has been removed, but if you look carefully you can see the remaining single storey bit of the pub with the porch and "Mucky Duck" over the door which was open for many years after the war. Link Fairey, where are you. And of course, after the Mucky Duck closed, it became the famous and now sadly missed Boardwalk. Yes you are correct, I went on other peoples input, I should have checked, by the way were you ever part of the cast of a Pantomime? Oh no I wasn't! And then - "Under The Boardwalk"
I sometimes think my entire life has been one big Pantomime. I've only been to one Panto in my life. I was about five and a maiden aunt took me to see Mother Goose at the Empire. The only seats available were behind the little booth in the circle that housed the "Spotlight Man". I don't remember much about the goings off on the stage, but the antics of the foul mouthed old man who operated the spotlight were an eye opener to a young lad. Every so often the arc lamp would fizzle out with a pop and then the fun and games would start. He would open the casing and then the cussing in the most offensive language would start as he burnt his fingers trying to change the red hot carbons. 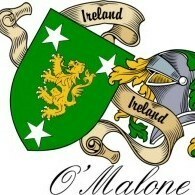 My aunt tried her best to cover my ears but my little knowledge of anglo-saxon expletives was vastly improved. The things that you remember ! In the late sixties the snooker room was considered state of the art and I remember going to watch John Spencer take on some lesser known, for money. It was a busy place at that time. Thanks for that, I have not been around there for years. But nice memories. 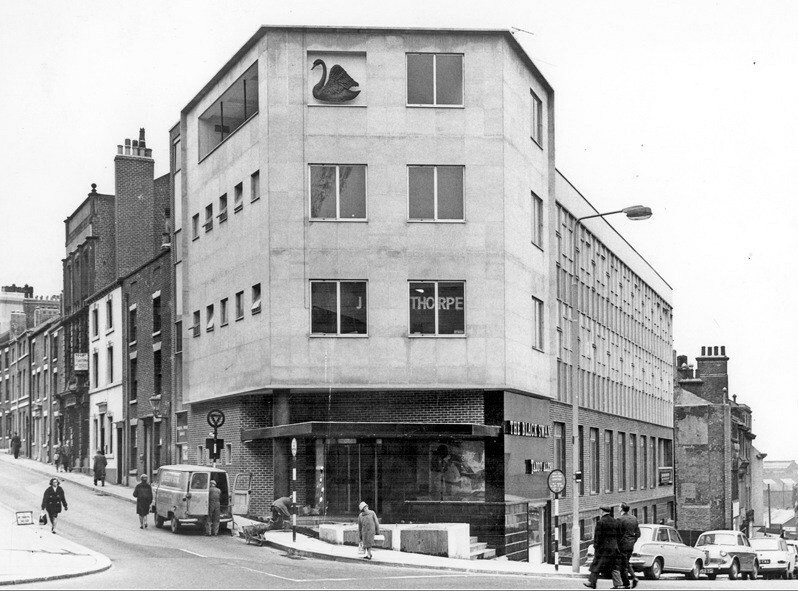 I posted that the Black Swan was on the opposite corner to where it finally stood on the other side of Bank Street, this photo says exactly that. Oh No It Still Wasn't. The photo shows the pub as it was before the Luftwaffe modified it somewhat. The photo clearly shows the pub building located just above the pawnbroker's premises and behind the women in the white aprons was a door to the back of the pub. Before the blitz there were shop premises above the pub running up to the corner of Bank Street. After the bombing the pub lost most of it's upper stories and the shop premises above were levelled and remained a bomb site up to the rebuilding. When the pub was rebuilt it utilised the original site and also the cleared site of the shops above it. 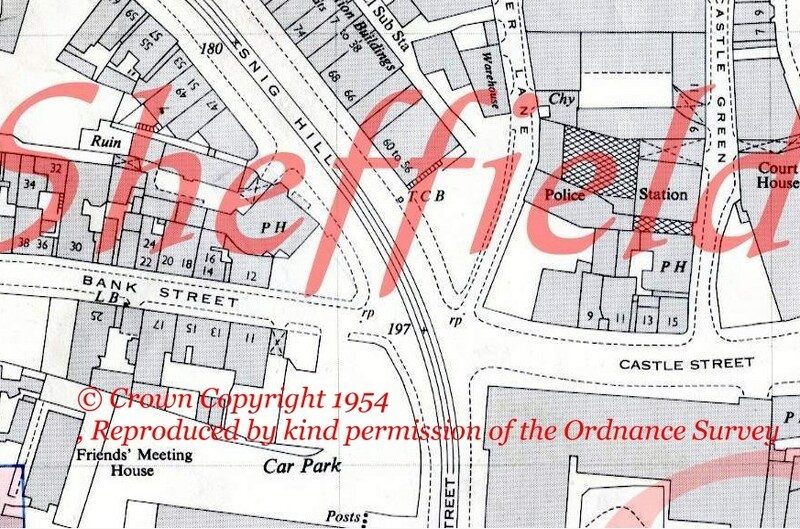 This can be clearly seen in the Picture Sheffield photos s22225 and s19557 I posted earlier. I would stake my reputation as a Confirmed Idiot that the pub never existed on the other side of Bank Street. I must have spent a significant portion of my life in the Fifties waiting for a Malin Bridge bus outside the Mucky Duck porch. I have found a number of wrongly identified photos in books over the years, also on Picture Sheffield. I seem to have a photographic memory and remember scenes very clearly. I have to disagree I'm afraid. During the Blitz the entire area from Market Place down to Bank Street was flattened. There are plenty of photos to confirm that. The first building to be restored was Cockaynes which was started in 1949 and finally finished in 1955. It incorporated a tunnel like arcade connection from Hartshead to Angel Street under it's top corner. This was to replace Watson's Walk. It later became Schofields and then the Argos store. Below this new building the entire area down to Bank Street was used as a temporary car park. In around 1961 the ABC Cinema was built on this site down as far as Bank Street. When the ABC was demolished the site was used as a car park (again). Eventually the Premier Inn was built on the entire plot from the Argos boundary down to Bank Street. 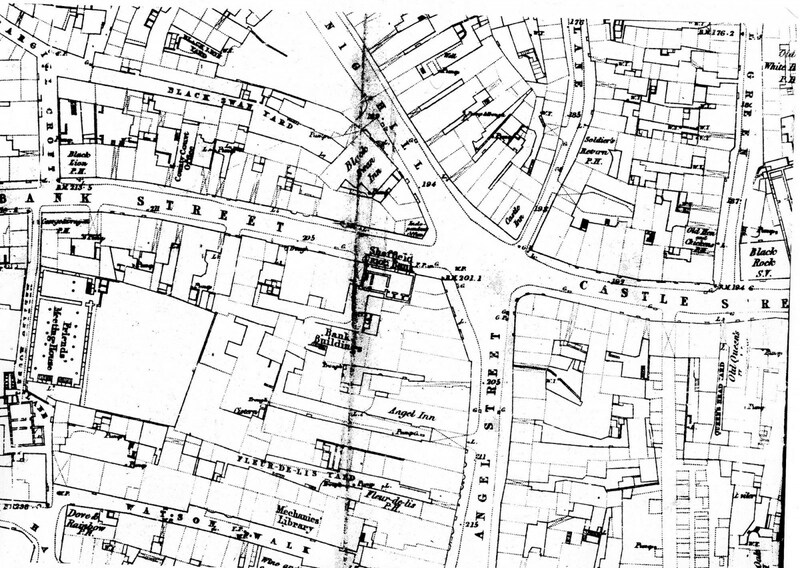 The only pub in the area you're talking about was the Angel Inn and that disappeared in December 1940. Comments possibly from other forummers ? If you remember H.D. The upper stories of the pub were damaged during the blitz and was left like that until it's demolition, it wasn't flatened as you infer in the blitz, shall we agree to disagree? I meant the area above Bank Street was completely flattened. You can see pictures on PS of looking through to King Street, Angel Street from Hartshead with nothing in the way. 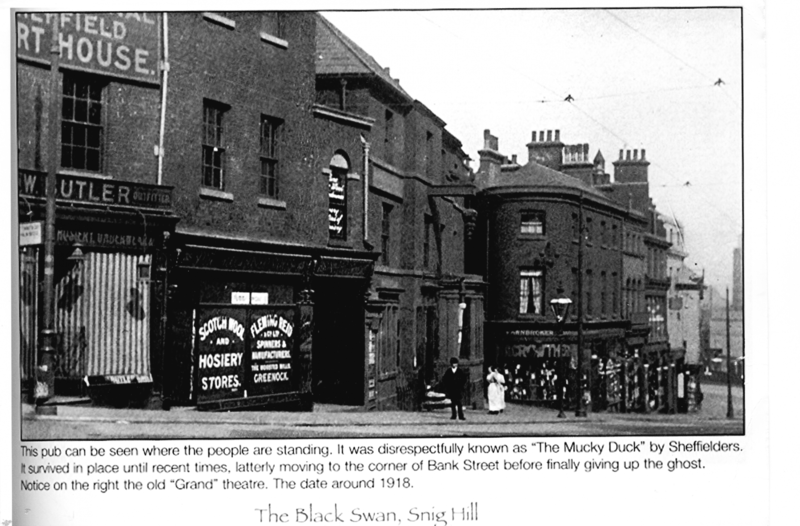 The Mucky Duck was below Bank Street and lost most of it's upper stories. They built a bit of a porch out onto the pavement and I guess the rescued Mucky Duck sculpture was re-sited on the top of that. The Picture Sheffield photos clearly show it's position a little below the Bank street junction. All this can be confirmed by study of the Picture Sheffield photos. I remember the whole area below the then new Cockaynes down to Bank Street being being left flat for many years but I don't remember the old Black Swan at all, though I went to the new one many time. 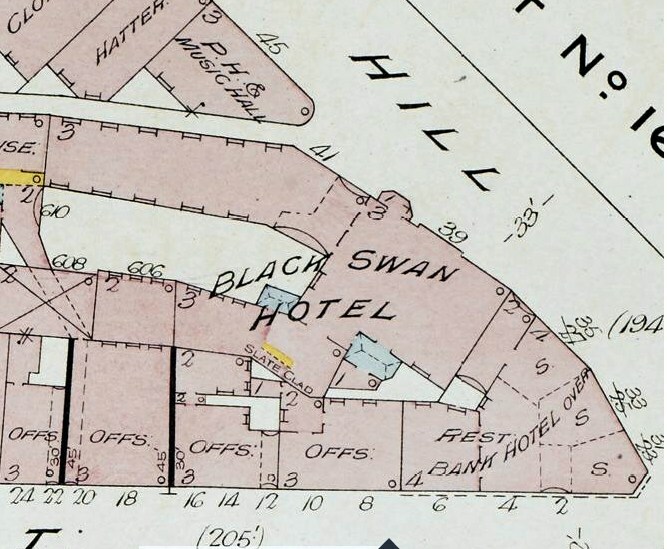 Below is a link to Picture Sheffield showing blitz damage to the old Black Swan, if the caption is correct, I am not sure if this helps at all.